Researchers reported that in a randomized, placebo-controlled study, trofinetide, at the highest dose, resulted in statistically and clinically meaningful improvement on three Rett syndrome specific efficacy measures in children and adolescents. Treatment with trofinetide demonstrated significant benefit in a phase 2 trial in girls with Rett syndrome, a rare severely disabling neurodevelopmental disorder, a new study indicates. The multicenter double-blind, placebo-controlled, parallel-group, randomized study, which enrolled 82 participants ranging from 5 to 15 years old, tested three doses of trofinetide compared with placebo. Results of the trial provide class 1 evidence that the agent was well tolerated at all dose levels twice daily—50 mg/kg, 100 mg/kg, and 200 mg/kg. At the highest dose, trofinetide resulted in statistically and clinically meaningful improvement on three Rett syndrome specific efficacy measures in children and adolescents, At the highest dose, trofinetide resulted in improvement across a range of Rett syndrome symptoms in children and adolescents, according to the study published in the March 27 online issue of Neurology. Developmental regression in Rett syndrome includes loss of expressive language and purposeful hand use, impaired or absent ambulation, and the onset of stereotypical hand movements. Disease burden is severe and lifelong for patients and their families. The study offers further support for the safety, tolerability, and efficacy pof trofinetide. Along with the findings of a previous 2017 trial in adolescents and adults, the latest results show promise in trofinetide's viability as a potential treatment for this neurodevelopmental disorder, Dr. Jones said. Rett syndrome, which affects girls almost exclusively, has an incidence of 1 in 10,000 to 15,000 births and typically becomes apparent between 6 and 30 months of age. Most cases can be attributed to loss of function mutations in the X-linked gene, methyl-CpG-binding protein 2, encoding a protein that binds to DNA and regulates transcription, the authors noted. Trofinetide is a novel synthetic analogue of a naturally present neurotrophic tripeptide (GPE) derived from insulin-like growth factor-1 (IGF-1), a growth factor produced by cells in the brain. Its mechanism of action stems from the normalization of neuronal and glial abnormalities, as demonstrated by treatment with GPE in tissues from individuals with Rett syndrome as well as in animal models of Rett syndrome. “These [neuronal and glial] abnormalities represent significant developmental disruption of normal maturational events,” pediatric neurologist Alan K. Percy, MD, FAAN, a co-author of the study and professor and director of the Rett Syndrome Clinic at the University of Alabama at Birmingham, told Neurology Today. Dr. Jones added that trofinetide appears to replicate the same activities as the natural tripeptide—spurring neurotrophic activity, promoting synaptic development and plasticity—one of the cellular mechanisms underlying learning and memory—as well as regulating neuroinflammation and microglial function. “In Rett syndrome, synapses are too few and are underdeveloped due to insufficient formation and maturation of dendrites resulting from impaired neuronal protein synthesis and excessive pruning by overactive microglia,” she explained. In acknowledging the study's limitations, the authors cited the small size of the treatment group and the short duration of therapy. The lack of a robust biomarker to assess overall improvement is an additional limitation not directly related to this agent, Dr. Percy said. In 2018, Neuren Pharmaceuticals entered into an exclusive North American license agreement with ACADIA Pharmaceuticals Inc. for the development and commercialization of trofinetide for Rett syndrome and other indications. In a phase 3 double-blind, placebo-controlled study expected to commence in the second half of 2019, ACADIA will evaluate trofinetide in a larger study exploring a longer treatment duration evaluating trofinetide in approximately 180 girls with Rett syndrome. The findings of the adolescent and adult trial in Rett syndrome, which were published in in 2017 in the journal Pediatric Neurology, served as a guide to investigators in designing this study. The first 62 participants in the recent trial were randomized to placebo or one of three twice-daily dose levels of trofinetide: 50 mg/kg, 100 mg/kg, or 200 mg/kg, stratified by age. After a review of blinded safety and tolerability data, investigators altered the study design to enroll 20 additional participants randomized to the highest dose or placebo. Enrollment began in March 2016, and the study was completed in January 2017. Of the 82 participants from 12 Rett syndrome research centers in the United States, 24 were randomized to the placebo group, 15 to the 50 mg/kg trofinetide twice daily, 16 to 100 mg/kg trofinetide twice daily, and 27 to 200 mg/kg trofinetide. The cohort ranged in age from 5.1 to 15.9 years, with a mean of 9.7 years; 94 percent were white, and the mean weight was 26.1 kg. Participants received single-blind placebo treatment for 14 days followed by 42 days of double-blind treatment with either trofinetide or placebo. A post-treatment visit occurred about 10 days after the conclusion of therapy. Medication or placebo were administered via a strawberry-flavored liquid orally or via gastrostomy tube. At all three evaluated dose levels, trofinetide demonstrated very good safety and tolerability, and no deaths occurred. Safety assessments included monitoring adverse events, clinical laboratory tests, vital signs, electrocardiograms, physical examinations, fundoscopy, and concomitant medications. Seizures were recorded in a caregiver diary. The most common side effects in all treatment groups were moderate diarrhea, mild vomiting, upper respiratory tract infection, and pyrexia. Only one participant (200 mg/kg group) was withdrawn from the study at her parents' request, due to worsening mild gastroesophageal reflux, moderate diarrhea, and mild vomiting, which later resolved uneventfully. There was statistically significant evidence of clinical improvement (p<0.05) for the 200 mg/kg BID dose over placebo in three core measures: Rett Syndrome Behavior Questionnaire (total score, core neurobehavioral symptoms, p=0.042), Clinical Global Impression of Improvement (overall clinical status, p=0.029), and Domain Specific Concerns Visual Analog Scale (most concerning aspects identified by clinicians, p=0.025). Some of the efficacy measures indicated improvements across a range of symptom domains and individual symptoms, such as repetitive behaviors, breathing problems, mood abnormalities/disruptive behavior, ambulation impairment, and seizures. This multiple-domain effect was in accordance with the findings of the adolescent and adult Rett-001 trial, which enrolled participants ages 16 to 45. An editorial in the same issue of Neurology said the study “provides a remarkable glimpse into the future of targeted treatments for neurodevelopmental disorders.” Until now, the authors of the editorial noted, most of the targeted treatments that have shown promise in animal models have not translated to patients. The positive findings in this trofinetide trial could have stemmed partly from evaluating younger children, including a placebo run-in, and utilizing measures designed specifically for Rett syndrome, the authors of the editorial said. Embarking on a targeted treatment at a younger age may offer the most benefit to a child with Rett syndrome, said Randi J. Hagerman, MD, the editorial's corresponding author and medical director of the MIND Institute at the University of California, Davis, where she is distinguished professor and endowed chair in Fragile X research. In a young child, Dr. Hagerman suspects that controlling a protein's expression may have positive effects on the developing brain. As a result, “you build a better brain to handle the demands of developing normal cognition,” she said. Targeting specific biochemical signaling systems in the brain marks the beginning of a new area in pharmaceutical trials for neurodevelopmental disorders, said Gregory N. Barnes, MD, PhD, associate professor in the department of neurology and director of the University of Louisville Autism Center in Louisville, Kentucky. Investigators of future studies would want to “flesh out” the optimal dose, frequency, and mode of administration, as well as the time to a measurable effect. “Is 200 mg/kg BID really your top dose or not?” Dr. Barnes questioned. With the high cost of new medications, it would be ideal if a drug could work well at the lowest possible dose, he said. The positive effects of trofinetide compared with placebo are encouraging, and participants' regression after stopping the medication at the trial's conclusion adds credibility to the results. However, Dr. Barnes said, trofinetide's performance over a longer period is important to ascertain. As an exploratory study, the phase 2 trial “wasn't large enough or long enough to prove that this drug is safe for clinical use.” For instance, potentially rare events such as 1 death in 1,000 individuals would have evaded detection, Dr. Mehta said. The fact that trofinetide is a derivative of insulin-like growth factor-1 raises concerns over the potential for long-term risks, such as cancer, weight gain, and hormonal imbalances. Determining these risks requires “months to years of monitoring patients on a medication before they are known,” he said. Furthermore, the data raise a number of important questions for future researchers to ponder. For example, despite the overall separation from placebo on a number of symptom measures, a subset of patients taking the highest dose of trofinetide experienced significant improvements while others on this dose did not make any progress, Dr. Mehta said. Dr. Percy was an investigator in the Neuren trofinetide clinical trial reported in this article and Rett-001 trial of trofinetide in adolescents and adults. He is a consultant to Anavax, AveXis, and Teva, and participates in trials sponsored by Newron Pharmaceuticals SpA. Dr. Mehta disclosed no competing interests. Dr. Hagerman has received funding from Novartis, Marinus, Neuren, National Institute on Child and Health Development, and the National Fragile X Foundation to conduct clinical trials in Fragile X syndrome, and she has consulted with Zynerba and Fulcrum on trials in Fragile X syndrome. •. Glaze DG, Neul JL, Kaufmann WE, et al Double-blind randomized, placebo-controlled study of trofinetide in pediatric Rett syndrome https://www.pedneur.com/article/S0887-8994(17)30405-8/fulltext. Neurology 2019; Epub 2019 Mar 27. •. Hagerman R, Tuchman R. Editorial: Turning the tide on targeted treatments for neurodevelopmental disorders https://www.tandfonline.com/doi/full/10.3402/qhw.v11.31987. Neurology 2019; Epub 2019 Mar 22. •. Glaze DG, Neul JL, Percy A, et al A double-blind, randomized, placebo-controlled clinical study of trofinetide in the treatment of Rett syndrome https://www.pedneur.com/article/S0887-8994(17)30405-8/fulltext. Pediatric Neural 2017;76:37–46. 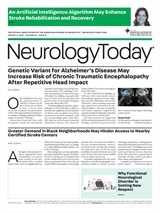 Neurology Today19(7):18-22, April 4, 2019.